Hoka has made some interesting changes in the last few years. They have continued to evolve as a footwear company and are expanding to diversify their product. The recent expansion of two stability models caught my eye and I decided to take the plunge trying the Arahi, the moderate stability version of the two (the Gaviota being the supposedly motion control or high stability version). The way they decided to induce stability was most interesting given the J frame concept. From my understanding, the J frame is meant to both cradle the heel as well as provide stability along almost the full length of the medial longitudinal arch. An interesting concept with potential. Does it work? Well... to a degree. Let's discuss the Hoka One One Arahi. As with most Hoka shoes, the upper does fit a bit narrower in the forefoot. This is improved by a slightly stretchy mesh upper that accommodates some degree of foot swelling. The heel and midfoot are fairly average volume if a little loose in the heel. The upper uses a thin mesh with additional thicker material that helps it flex while being durable. 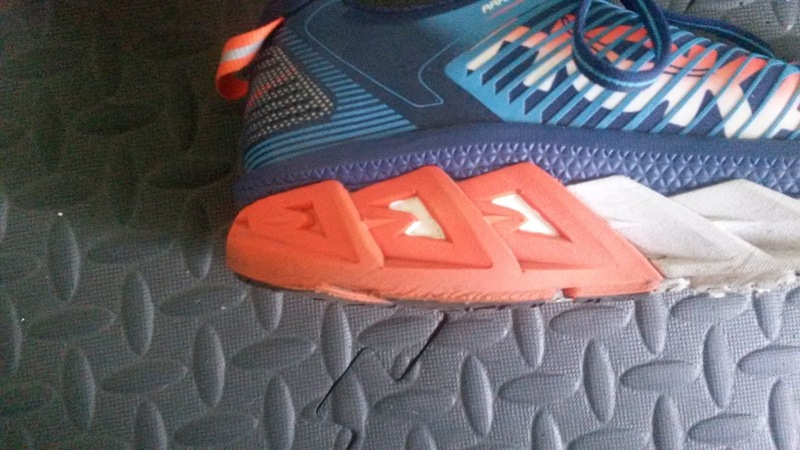 This aspect of the upper makes up 3/4 of the top of the shoe and seems to stretch more the farther back in the shoe you go. The heel cup is very well cushioned. Those with sensitive achilles will have no issue with this shoe although I would still recommend wearing socks. The upper material does stretch somewhat due to the lighter breaks in the tougher parts of the upper. I have had zero durability issues with the upper. Despite the stretchy mesh, it does fit snug on the forefoot. With time the mesh does stretch a degree, but know that fit wise this shoe will work better for those with medium to narrow feet. 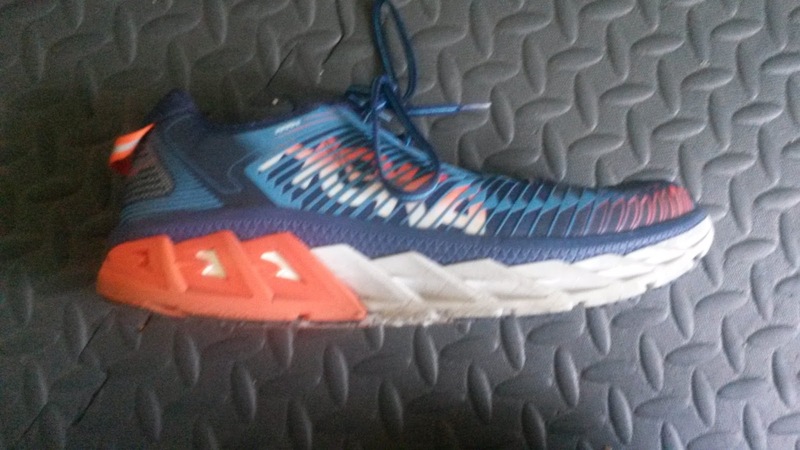 HOWEVER, Hoka is offering a 2E (wide) width in the Arahi, so those needing some additional width should look to the wide version. Lateral aspect of the upper that flexes somewhat with the foot. Sizing wise the Arahi fit me very true to size. I generally wear a men's size 10 and that is exactly how the shoe fits. Initially it does feel maybe a little small but that may be due to the snug fit up front. The trade off with the snugger fit is that when the pace picks up, the upper holds the front of the foot down very well. 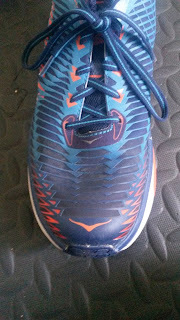 A typical 5mm drop in this soft shoe can sometimes feel lower due to midsole compression when landing farther back. 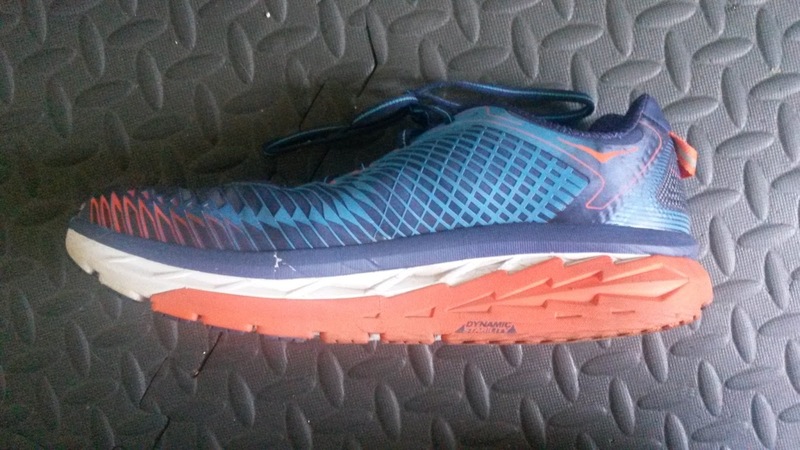 Like all Hokas, the outsole has full ground contact and the wide sole width makes the Arahi stable by default. 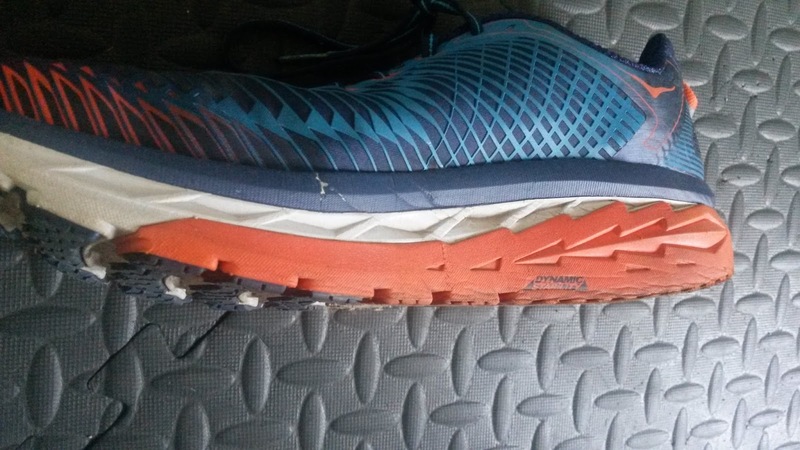 It is fairly traditional Hoka, although there are far more deep flex grooves that should help to a degree to improve flexibility and smoothness of the midsole. There is the traditional rocker midsole with a fairly sized posterior heel bevel. With the Arahi, Hoka has added what they call Late Stage Metarocker. 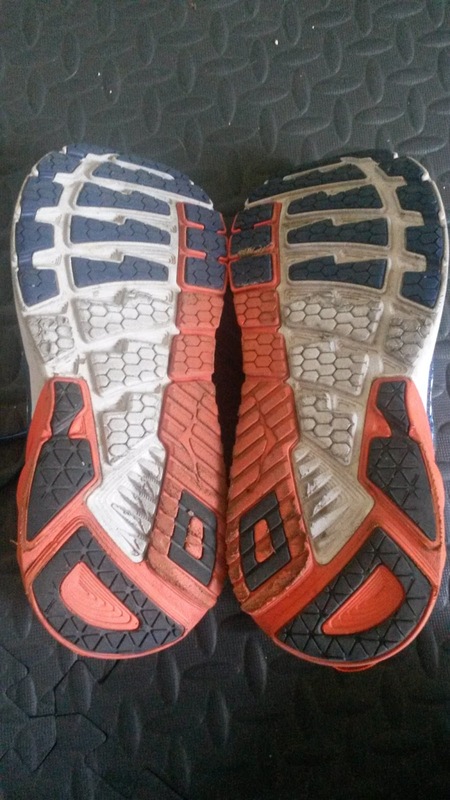 They have moved the toe spring forward, which in my mind is a decent way to try to stabilize the forefoot by trying to make the path of least resistance in the forward direction. This decreases the front awkward roll forward feeling I typically notice with other Hokas and makes the ride more stable in the front. Durability is about average. This photo was taken with about 70 miles on the shoe. The outsole does appear to wear quickly but the midsole is thick enough you may not notice. Durability ride wise is not fantastic as the shoe started feeling a little more dead around 80 miles. Being a Hoka, the ride is definitely on the softer side throughout the shoe. This is not an uptempo trainer despite being in the mid 9 ounce range (which is great for a stability shoe). This is a softer but slightly lighter mileage shoe. Some people will be able to get away with longer tempo runs but there are many other shoes I would choose for workouts. The softer ride is definitely a key characteristic. The side effect of this is that the stability from the J frame is severely muddled. Initial miles in the shoe made me question if the J-Frame actually did anything. However, when I began to fatigue after 12-13 miles, I began to sense the stability from the different foam densities. Unlike the Hoka Infinite, the side walls do not come up as high, so I have not had any issues with blisters along my arch. I do feel some support particularly in the heel as the foot sinks into the rear portion of the J Frame. The frame is nice in that it will lightly guide the foot if you pronate or supinate at the rearfoot. Emphasis on lightly as the support is very mild. I do not feel as much of the stability through the later mid or forefoot but suspect that may be due to the tapered post. Partially extended post from the J-Frame. I feel more from the late stage metarocker in terms of forefoot support than the J-Frame. I have discussed this previously on this blog that many shoes labeled as stability or put in that category are not as stable as they claim. The labels may need to be done away with as there are multiple ways besides a post to do stability. These all include wider soles, heel counters, posting (as mentioned), sole wedges, sole density changes (also technically posting), upper fits, rocker soles, etc. These and more contribute to whether the shoe is stable or not. In the case of the Arahi, though it is labeled as a stability shoe and has different density midsole materials (aka posting) that should provide stability, the softer sole sabotages that. A softer sole is inherently more unstable. Like running on pillows vs cement. Adding firmer density material will create a degree of stability, but not to the degree Hoka claims. This shoe is a mild stability shoe at most thanks to the softer sole. It is helped somewhat by the wide last but the softness detracts from that stability. 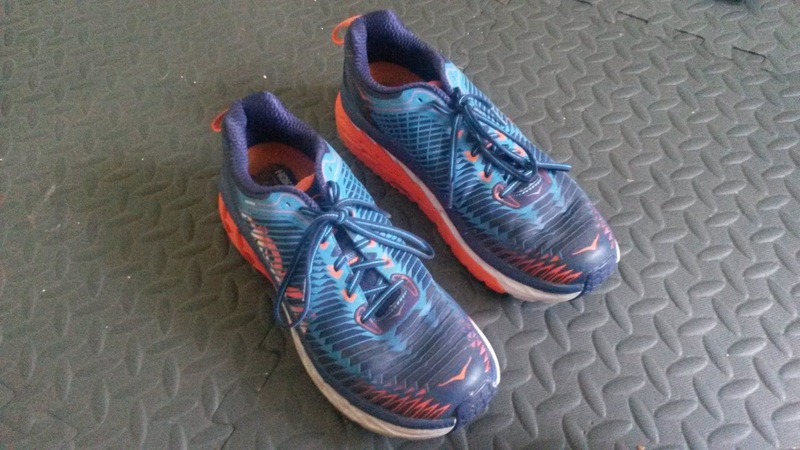 Stability shoes should generally be firmer. Not bone crushing, but the increased firmness not only provides a more stable platform, but can provide increased proprioceptive feedback that may help the runner realize where their bodies are. Proprioception is an individual's sense of their body and body parts within space. This is very important to runners to know how hard they are landing, where they are landing, if they need to modify their shock absorbing capabilities based on the surface, whether they need to modify their steps due to unstable terrain and more. It is something I commonly see lacking in those with repeated injuries because there may be a delay in their detection of how much force is going through their bodies (interestingly I also see this commonly in those with shoulder, low back and neck issues). Decreased proprioception may lead to delayed muscle firing and prep for landing during the initial contact phase of running. Your shock absorbers, ie the quads, glutes and depending on your foot strike the anterior lower leg muscles or calves need to be on before you land to prepare to absorb landing forces. Decreased proprioception means the individual may misjudge when that landing is about to happen. So instead of your muscles being ready to absorb those impact forces, the delay means you must now relay on passive structures (tendons, ligaments, joints, etc) to deal with those forces. You can image over time how that could lead to an injurious situation. Having a shoe be a little more firm does mean a little more impact, but the interesting thing is that tends to improve muscle loading. Our theories are that the increased firmness and initial shock activates more joint receptors, which in turn may help proprioception, initiate protective response and increase muscle firing. If nothing else, the firmness also provides a better contrast between the firmer posting and the traditional foam. Thus you will be able to feel the stability more than an overly soft shoe. While I applaud Hoka for attempting a great method of stability, the pillow like softness of the midsole defeats a great deal of their efforts, rendering the Arahi more of a light stability shoe at most. While this is not a bad thing, especially paired with the lighter weight and still great protection, I think some clarifications need to be made. I would market the Arahi as a light stability trainer and the Gaviota as the moderate stability shoe. For those with higher stability needs, the Gaviota's true full length medial stability (bonus points for having the posting go the entire way into the forefoot) will be best. The lighter weight at 10.4 ounces makes it a great shoe for those looking for support. Those those looking for a lighter trainer with more cushioning and a hint of stability, the Arahi is a great choice. So the Arahi is still a good shoe, Hoka just needs to adjust their label of it. I look forward to seeing more from Hoka and am excited to see what happens with version 2. As always, my views are my own. My blog should not and does not serve as a replacement for seeking medical care. If you are currently injured or concerned about an injury, please see your local running physical therapist. If you are in the LA area, I am taking clients privately for running evaluations based on my Orthopedic Residency schedule. ***Disclaimer: These shoes were a personal purchase and were obtained for their full US retail price. This in no way changed or influenced the honesty of this review. I put at least 50-75 miles on trainers and 25 miles on racing flats. 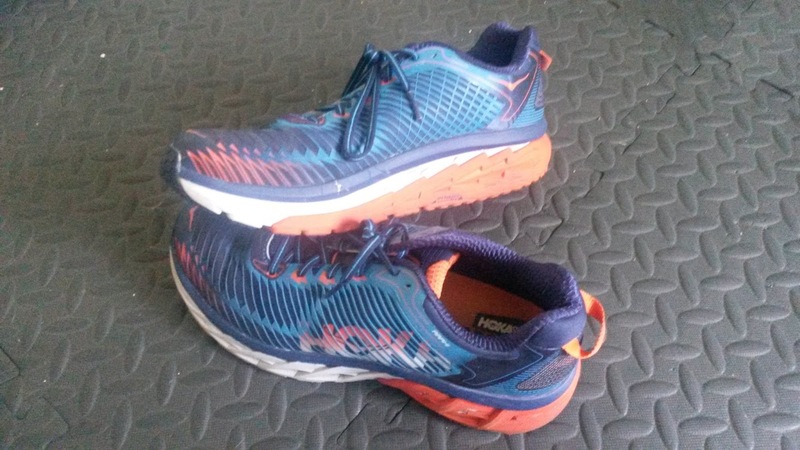 Currently my pair of Hoka Arahi have 85 miles on them. I have since sent them to Dr. Kollias for his opinions as well. This is the great benefit of both of us being a Men's size 10.